Rhodes and Fort Hare Universities have been active in ICT for Development for many years, through the two Telkom Centres of Excellence in Telecommunication hosted in their Computer Science departments (www.coe.ru.ac.za; www.coe.ufh.ac.za). In 2006, this activity has given rise to a field test site, in the Mbashe municipality in the vicinity of the Dwesa-Cwebe Nature Reserve, in the rural Eastern Cape Province. 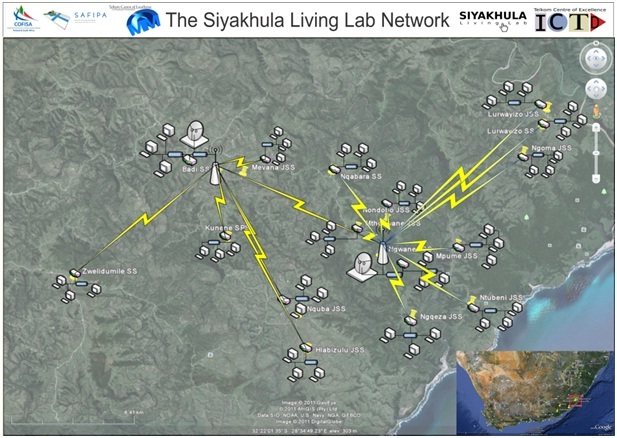 This initiative, now called the Siyakhula Living Lab (SLL) is organised along the lines of the emerging RDI living lab methodology whose main underlying principle is co-creation of solutions with empowered users. SLL shows in a practical fashion how marginalised rural communities that are difficult to reach, may in future be joined with the greater South African and African communities to the economic, social and cultural benefit of all. Other departments at the two institutions (Anthropology, Communication, Education, African Languages, Information Systems, Journalism and Media Studies, Sociology) have joined the project, giving it a strong, and necessary, multi-disciplinary flavour. The original objective of the project was to develop and field-test the prototype of a simple, cost-effective and robust e-business/telecommunication platform, to deploy in marginalized and semi-marginalized communities where a large number (over 40%) of the South African population live. The project has evolved to include a generic service integration platform to support services for rural and peri-urban areas in South Africa. 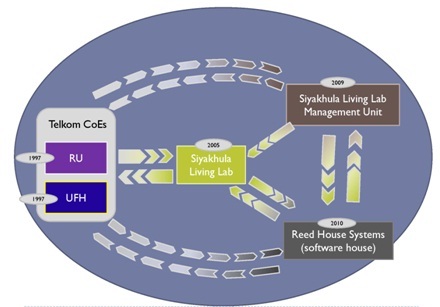 The need to transform into robust industrial products the experimentation in the Siyakhula Living Lab has given origin to a software house, Reed House Systems (RHS, www.reedhousesystems.com), which started its operations in 2010. RHS is at the moment hosted in the campus of Rhodes University, and offers internships to Rhodes and Fort Hare students. The service integration platform is called TeleWeaver, and this has its ‘business model’ and capacity of being a game changer in the way of introducing ICT infrastructure in marginalized areas. 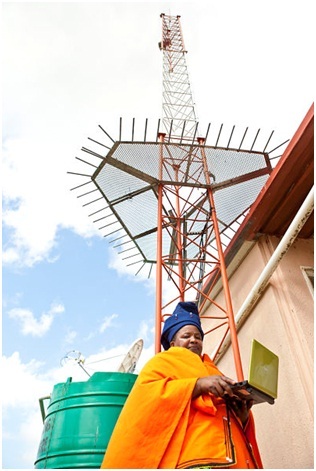 SLL, RHS and the two Telkom Centres of Excellence constitute an innovation eco-system whose main focus is the introduction of meaningful ICTs in marginalized areas. The eco-system and the relations between its components are represented in the diagram. The starting point is the creation of a ‘broadband island’, i.e. the provision of points-of-presence, typically located in schools, which are connected wirelessly to each other at reasonable high speed. For this connection we use fixed and mobile WiMax, which we find very good and cost effective, but wifi can be an option, as well as other technologies, depending on geography and licensing. Then, one or two of these point-of-presences (which we call DANs, Digital Access Centres) have a connection to the Internet, to serve the whole broadband island. The nature of the connection to the internet depends on where the broadband island is located. In SLL we use a satellite connection, but GPRS / 3G can be considered, or even fixed lines, for peri-urban deployments. This architecture is the result of an evaluation of bandwidth needs and costs, and not surprisingly reflects the rather standard LAN / WAN structure, which still makes sense in our context, but will evolve if the costs or needs change. The following picture illustrates the network as it is. While the network infrastructure is completed (base stations, satellites links, configurations), only 6 points have their Customer Premise Equipment (CPE) installed right now. The CPE rollout and the attached hardware should be completed by the end of the first semester 2012. Each point-of-presence contains a variable number of terminals, realized as thin clients. Depending on the circumstances, the central server is a single machine or a cluster of a few, less powerful machines. All elements in the DANs can be either new or refurbished. (Cluster for the central server allows the use refurbished machines there as well.) Edubuntu, of the Linux OS family, is used throughout the deployment. 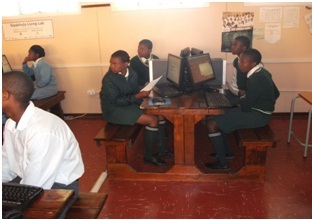 Here below is a picture of the DAN in Ngwane, during a computer literacy session for the pupils in the school. Eastern Cape e-Skills CoLab: ICT for Rural Development.